TravelOnline/Reservation Officer can check important updates/announcements for you on the items included in your packages: [Hotel/Airline/Transfer Companies/etc.]. TravelOnline/Reservation Officer can also provide you the contact of the purchased item concerned. It is beyond TravelOnline/Reservation Officer's power to change Airline/Hotel/Government/Entities decisions/implementations during your trip. TravelOnline/Reservation Officer, as the middle man, do not have power to influence Airline/Hotel/Tour/Restaurant/Government/Entity changes. When direct/urgent decision is needed, we will need you to speak to the Airline/Hotel/Tour/Restaurant/Government/Entity concerned directly. In unexpected cases/emergency cases [such as flight delays or cancellations, etc], TravelOnline/Reservation Officer will talk to the Hotel/Airline/Transfer Companies/etc. on your behalf to check for possible options. TravelOnline/Reservation Officer will relay options to you as received from the purchased entity. In unexpected cases/emergency cases [such as flight delays or cancellations], kindly work with TravelOnline/Reservation Officer in looking/deciding for possible alternative steps to take. For it is beyond our power to 'create' alternatives. TravelOnline/Reservation Officer , as the middle-man, relays options as provided by the concerned purchased entities. TravelOnline/Reservation Officer extends customer care in inquiring for 'available' solutions from entities purchased should there be valid emergencies that may be encountered during a trip. If the Airline/Hotel/Tour/Restaurant/Government/Entity doesn't have the ability to change it or solve it, TravelOnline/Reservation Officer doesn't have greater ability to do so. As the middle-man, all ITEMS and OPTIONS are presented AS-IS and WHERE-IS. In cases of emergencies/accidents/force majeure, TravelOnline/Reservation Officer offers customer care as a middleman in talking to the Airline/Hotel/Tour/Restaurant/Government/Entity for possible solutions and options that "they" can give you. If the Airline/Hotel/Tour/Restaurant/Government/Entity doesn't have the solution that you want, TravelOnline/Reservation Officer doesn't have greater power to provide it. The scope of our work is helping you coordinate to these purchased products/entities, solutions-problems will not originate from us - the middleman. Our work is mainly customer service as a middleman and any mishaps of the purchased entity is CLEARLY out of our control and is not our liability. TravelOnline is not liable for any expenses you incur for doing your complaints against the Airline/Hotel/Tour/Restaurant/Government/Entity [whether legal or medical or arbitrary] and therefore are on your personal account. TravelOnline/Reservation Officer purchases third party Airline/Hotel/Tour/Restaurant/Government/Entity for you and pays for it in full. Our commitment is to pay every service you pay us to the third party you purchased in full and on time. All payment for services is immediately forwarded to your purchased entities and subject to cancellation policies and booking restrictions of each individual entity purchased. Cancellations and Booking changes are not on the power of the travel agent anymore after payment but rather subject to strict business policies of Airline/Hotel/Tour/Restaurant/Government/Entity where the payment has been dutifully forwarded to. Deciding to not use a service and expenses incurred to replace a finalized/paid service are on your personal account and are non-refundable/non-reimbursible. I. FAQ: Can the quoted price change? *Price may increase if airfare increases before payment is made. Once the client is paid on or before the due date, the price will no longer change. Airfare may increase from time to time base on remaining seat availability. Booking is only considered final once payment is made and ticket is purchased. II. FAQ: Can I still change my booking details after I paid? *Kindly check all the inclusion details in your email invoice. Please review price, flight details and spelling of names if correct, for these are the exact items which will be purchased instantly once payment is received. Upon receiving your payment, this invoice will be considered ‘bought’ and cannot be changed anymore. Travelonline implore you to check everything and settle all concerns with your reservation officer before payment. Once you pay your package, it is considered SOLD and any changes after booking is not allowed and subject to penalties. *Flights booked thru TravelOnline are governed by the terms and conditions of the airfare you purchased and are determined by the Airline (not TravelOnline Philippines). In most cases, airfares are fully non-refundable and non-transferable (strict airline policy). But in some instances, it 'may' be rebookable with rebooking fee + price difference + penalties. Please call your reservation officer to check Airline policy. *Hotel payments are non-refundable (strict Hotel policy) but in some instances 'may' be rebookable depending on the purchased hotel's cancellation policy. Please call your reservation officer to check Hotel policy. *Special Cancellation Conditions may apply for some products especially on vouchers purchased during limited slots dates. Please expect vouchers purchased under "rush" or "holiday/peak" conditions are already NON-REFUNDABLE/NON-REBOOKABLE/NON-TRANSFERRABLE/NON-CHANGEABLE. *Any unused portions of your package are nonrefundable. III. FAQ: Can I rebook/refund/transfer/change the names/details ON my booking? *This promo is book and buy. The tickets are non – rebookable / non-refundable / nontransferable. You cannot change dates or names of persons or details in this booking once you have processed the payment. Any changes or addition will result in penalties and price increase. In family/corporate/legal/personal emergency situations, the terms are still enforceable. All booking or changes in booking are subject to individual terms of purchased ENTITIES (airlines/hotel/transfers etc). For additional info, please refer to: TERMS X.1 and TERM XII. Please call your reservation officer to check the policy of the ENTITIES purchased in your booking. IV. FAQ: Are flight delays in the Travel agency’s control/responsibility? *Any flight delays / change is unfortunately outside of Travelonline's control. The amount paid in this package doesn’t include insurance or guarantee that there will be no flight changes/delays or force majeure situations during the trip. But you can be assured that Travelonline reservation officers will be available to assist you during your travel period in searching for possible options and solutions. In force majeure or unexpected situations, it is the responsibility of client to have emergency fund on hand for possible special transfers, personal alternative flight, unexpected hotel stay etc. which is out of TravelOnline's control or responsibility. V. FAQ: How can you help us in force majeure or unexpected/impossible situations? *The amount paid in this package doesn’t include insurance or guarantee that mishap won't happen during the trip. We serve as your travel guide who can instruct you on how to coordinate with airline transfers, hotel etc., in these emergency situations. 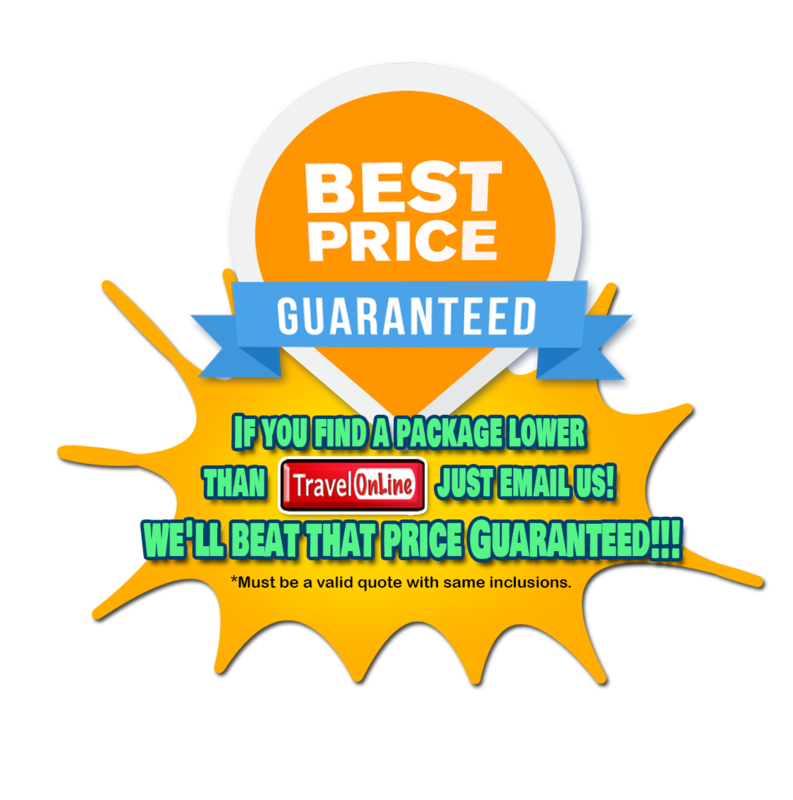 This is the extent of the service Travelonline offer based on Travelonline's market competitive price. The client agrees to indemnify and to save TravelOnline from harm and against all damage or injuries (including death) to property or person(s). Please do secure hazard/health/travel/life insurance that may be applicable or needed during your trip. *Since TravelOnline's conception, different unexpected government, institutional, weather-based situation has occurred under Travelonline's watch. Most of the cases, Travelonline know possible options and the best actions you can take. Just a strong reminder, there are emergency cases that you will really need to spend extra money to solve a situation or to avoid even larger loss or expense. Be ready in this situations such as, layover at a destination or forced overnight stay at a certain place because of a stranded/delayed flight, special transfer service when arriving at night or after 7pm, other unexpected situations that is out of human control or TravelOnline's control, etc. VI. FAQ: What to do when I have connecting flight? *If you have a connecting flight, kindly disclose it to us before you pay so Travelonline can change the flight given based on your needs. The burden of reminding the reservation officer will be on the client - please remind your reservation officer before paying. Travelonline are only able to help in planning and in suggesting a possible time allowance based on available flights. TravelOnline Philippines is not in control or liable for a possible no-show situation to your purchased package resulting from unexpected flight delays/cancellation of your connecting flight. ‘Safest’ is to schedule connecting flights a day away from your travel date. Be ready for emergency flight or coastline cases where you may be required to spend extra money or to purchase a new flight at your own expense, in situations such as: layover at a destination or forced overnight stay at a certain place because of a stranded/delayed/cancelled flight, emergency special transfer service, other unexpected situations that is out of human control or TravelOnline's control, etc. Travelonline will help you in negotiating with the ENTITIES (airlines/hotel/transfers etc), but approval will not be under Travelonline's control. Please be guided accordingly. VII. FAQ: Can I do early check in? Or late check out? *Standard hotel check-in: 2:00pm/3:00pm, standard hotel check-out: 11:am/12:00nn (can vary depending on hotel policy). VIII. FAQ: Do I need to print all the vouchers? What if we forget to bring my Travel Documents/IDs? *Please print ALL vouchers. Failure to present your vouchers will forfeit the paid inclusion. The name in the voucher/claimee should be present with a valid ID. Failure to present an ID forfeits the paid inclusion. Failure to present ID at airport will forfeit the flight. IX. FAQ: What happens if I am late for my flight? *You will have to purchase, on personal account, a new flight booking to travel to your scheduled destination. If you fail to check-in on time or board the aircraft by the boarding time, the fare you paid is already forfeited (strict airline policy). You will have to make another booking on the next available flight. Since this is last minute, you will need to purchase, the new ticket DIRECT at the airport/local booking office. IMPORTANT: If you are UNABLE to purchase a replacement flight, the whole BOOKING/PACKAGE is considered forfeited. SO please be responsible and do not be late to your purchased package. It is the client's responsibility to call Airline/Hotel 3 business days before travel to double check up-to-date status of the booking. (1) Paying this package means you agree with the terms and conditions indicated here. Payment of this package confirms that you understand and accept airline’s terms and conditions of carriage and fare rules to continue. The booking cannot be cancelled and payments made are not refundable. Disclaimer: Airlines/Travel Agency may refuse carriage of you or your baggage if, in the exercise of Travelonline's reasonable discretion, Travelonline determine either that the payment of your fare is fraudulent or the booking of your seat has been done fraudulently or unlawfully or has been purchased from a person not authorized by us. (2) Rooms are not reserved until you are ready to finalize. Payment for room only packages is required 24 hours after reservation. For packages with airfare, 4 hours reservation only. (3) NO BAGGAGE PACKAGE POLICY: * Promo is based on Airline Partner's Promo: If promo is not available we will give you a computation of upgrade to higher airfare classes. (4) Price paid note: this computation upon payment is confirmed and final. It is not comparable/refundable relative to new promos that may come available in a later date. Any unused portions of your package are nonrefundable. (5) Note: vouchers and/or etickets will be issued within the same day of payment. Voucher issuing time would be between 6:00pm to 8:00pm. (6) (For Boracay Only) Important information: there will be a one hundred (php100.00) pesos per person environmental fee and seventy-five (php 75.00) pesos per person terminal fee to be paid at the caticlan jetty port upon arrival and one hundred pesos (php100.00) pesos per person to be paid at cagban jetty port upon departure. The charges mentioned shall be under personal account. Prices mentioned are subject to change without notice so prepare your funds accordingly. (7) (For Boracay Only) Airport terminal fee in Kalibo Airport or Caticlan Airport (php200.00) is on personal account as well. Prices mentioned are subject to change without notice so prepare your funds accordingly. * (If your arrival time going to Boracay is before 05:30am, you will have to wait at the airport because your pick up will automatically be scheduled at 5:30am the same day). * First transfer out of the island is 4:30am. If your flight requires you to leave your Hotel earlier than 4:30am, you will automatically be scheduled 4:00pm a day earlier). * No matter how late your return flight is you will automatically be picked up at 4pm. (9) (For PPS/Elnido Palawan) Environmental fees by government are not yet included. (10) (For Elnido Palawan) Note: El Nido Electricity may vary from time to time. (11) (For Elnido Palawan) Note: The guest will still need to ride a tricycle (Php50 personal account) to get to the resort from the bus stop. The municipality encourages this to provide livelihood to locals living in the vicinity. If you are coming from Elnido Airport, additional Php150 per person per way for van transfer. (13) (Airport Check-in) It is your RESPONSBILITY to pass check-in requirements at Airport. Our Travel Agency service is limited on booking your airfare, hotel and packages but excludes airport documents processing. If you opt for this kind of requirement/document service, it is your responsbility to look for and we can refer you to contact other TA that offers such (Inform your reservation officer accordingly). It is on your personal account and responsiblity to prepare all necessary requirements/documents/ids you will need for smooth Airport processing. The packages you bought with TravelOnline is considered forfeited if you fail Airport requirements. (14) (Hotel Vouchers) For hotel vouchers, due to limited voucher acquiring slots system, they are non-refundable and non-rebookable even at FORCE MAJEURE situations or any travel circumstance. Please be guided accordingly. (15) List of Valid Ids for Airport Check-in: Philippine Passport, Driver’s License, PRC ID, NBI Clearance, Postal ID, Voter’s ID, SSS Card, Diplomat ID, OFW ID, OWWA ID, Seaman’s Book, Philhealth Card, Birth Certificate, OSCA/ Senior Citizen ID, Consular ID, Student’s ID, TIN Card. (16) For Cebu Airport transfers: Foreigners due to different preferences and built than Filipinos are suggested to upgrade to a bigger car set-up. Please inquire to your agent the updated rates before paying. (1) TravelOnline reservation officers provide service in finding the best price, booking your hotel, purchasing airfare, arranging transfers, arranging tours, and providing email quotations, summaries and information, whenever needed and applicable to your booking needs. Any force majeure events or corporate/government implementations that may affect your purchased booking is BEYOND Travelonline's control and is NOT Travelonline's liability. FLIGHT DELAYS/CANCELLATIONS and COAST GUARD DELAYS/CANCELLATIONS that are implemented are events beyond Travelonline's power to change or control. NOTWITHSTANDING, Travelonline is ready to assist you the best Travelonline can in finding possible options for you should this occur. We, as a middle-man service provider, will provide assistance to the best of Travelonline's ability, in negotiating and assisting in the rebooking/refund process (only if applicable), with the appropriate service fee [as indicated in TERM XII.1]. PLEASE NOTE: The final decision and options will always be in the hands of the ENTITIES purchased (Hotel/Transfer/Airline/Tour etc). Travelonline will relay to you the possible options given as it is given to us. (2) TravelOnline Philippines, the middle-man, and the CLIENT is SUBJECT to the terms and conditions of the purchased ENTITIES (airlines/hotel/transfers etc). (3) Rebooking of ENTITIES (airlines/hotel/transfers etc) will be subject to ENTITIES (airlines/hotel/transfers etc) availability of slots. (4) Travelonline is a 3rd party service provider who's job is to assist clients on finding the best deals by making personalized quotations, individually processing reservation and payment on behalf of clients from different service providers. For any cancellation, even on force majeure (acts of God, acts of nature, government mandated etc or any uncontrollable situations that leads to cancellation that is not TravelOnline's fault, a 30% TravelOnline cancellation service fee shall apply. This is to cover our cost for services provided during the initial booking/reservation and additional services to be provided for the processing of cancellation. Pls take note that when you seek assistance from a service provider and services was provided we are entitled keep our service fee even on trip cancellation. Just like when you seek assistance from a lawyer whether you win the case or not you are still obligated to pay your lawyers fee. Additional fee shall apply if Airline/hotel/transfer/tours is subject to penalty aswell. Cancellation fees shall be deducted on the clients total package amount and remaining refundable amount shall be returned to client minus payment sending fee if applicable. (5) TravelOnline Philippines is not liable of whatever nature for the acts, omissions or default, whether negligent or otherwise, of those service providers in connections with your convention pursuant to a contract between them and yourselves and over whom we have no direct control. We do not accept liability in contract or in tort (actionable wrong) for any injury, damage, loss, delay, additional expenses or inconvenience caused directly or indirectly by force majeure or other events which are beyond our control, or which are not preventable by reasonable diligence on our part including, but not limited to war, civil disturbance, fire, floods, unusually severe weather, acts of God, acts of Government or of any other authorities, accidents to or failure of machinery or equipment or industrial action. (6) TravelOnline Philippines is a third party entity and is separate from the most affordable "Airlines/Cruiselines/Transfers" you choose to book. Any cancellations or decisions of these separate entities are outside our control. We will only assist you in speaking with the entities but approval will always depend on their own strict terms and conditions. In cases when "GOING ROUTE", for example booked with PAL, implement changes that will affect a "RETURN ROUTE" booked on another airline, for example CEBUPAC, respective Airline penalties, fees and conditions will strictly apply. There will be instances where there will be conflict between the terms/policy of one company to another (e.g. PAL terms/policy vs CEBUPAC terms/policy). TravelOnline is not liable for possible expenses and charges you may need to pay due at this conflicting circumstances. TravelOnline as a third party service provider doesn't have control on the policies of the booked entities: AIRLINE/TRANSFERS/HOTELS etc. (7) Hotel / Airfare, / tours / transfers Cancellations or changes due to emergency maintenance, overbooking or local/government suspensions is beyond the control of TravelOnline . The client who books with TravelOnline understands that the package bought is not directly provided by TravelOnline but rather 3rd party products which is bought and arranged on your behalf by a travel agency. TravelOnline Philippines is not liable for loss due to any cancellation made by 3rd party. Moreover, if the client refuses the alternative option provided by the concerned party the client understands that the refund will be provided directly by the 3rd party and not travelonline. Other services or part of the package that is not affected by the cancellation is non refundable. (1)In cases when ENTITIES (airlines/hotel/transfers etc) allows such, Your TravelOnline Reservation Officer may assist you in the rebooking process, with a processing fee of Php500 per booking transaction [1-5 pax account increments]. This can be paid through our available payment options or can be subtracted to the reimbursable (in a form of a credit shell) amount, should there be any, as decided by the entities purchased (Hotel/Transfer/Airline/Tour etc). In cases where rebooking process requires the reservation officer to work overtime or beyond working hours (M-F: 9am to 7pm), additional billable hours will be required. No refunds will be made for services once travel arrangements have commenced. No guarantee is provided or warranted that any refund will be available. Should refund be available, it will be in a form of a credit shell. (2)Offered Packages, despite being quoted as one price, represent different business entities (Hotel/Transfer/Airline/Tour etc) not connected or related to each other. There will be separate rebooking/refund submission or request for each business entity with their distinct governing terms and conditions. Approval or disapproval of requests will be decided separately by each entities. There are instances that business entities' decision will be unfavorable to another (e.g. airfare allows rebooking but hotel refuses to, airfare offers refund but hotel only offers rebooking, etc). These are instances that are beyond Travelonline's power to change and is not Travelonline's liability. Notwithstanding, Travelonline will offer all available and possible options as relayed to us by the ENTITIES, so you can decide what is best for you. (3)Refund of an item (in a form of a credit shell), should it be approved or applicable, will be subject to the processing time of the business entity providing the refund. Mean processing time is 30 days to 90 days. TravelOnline will not shoulder in advance any needed refund as we have forwarded all payments to the ENTITIES(airlines/hotel/transfers etc) promptly and in a timely manner. There is no delay on TravelOnline's end. Thus, TravelOnline is not liable for any delays to the refund issuance decided by ENTITIES(airlines/hotel/transfers etc). There are instances where, you will need to shell out cash to cover an immediate expense needed at the destination. Rest assured Travelonline will issue applicable amount approved by ENTITIES (in a form of a credit shell), as soon as Travelonline receive it on Travelonline's end. Please be guided accordingly. (4)We will not provide refund from action taken by any government authority, including confiscation, seizure, destruction, restriction of travel, state of calamity, state of emergency, etc. (5)Please take note that refunds (which is in form of credit shell) will be base solely on the refund policy of ENTITIES(airlines/hotel/transfers etc). Amount refundable will be advice by the airline and hotel and the total net refund must deduct TravelOnline processing fees/service fees. Remaining amount left will be returned to the client (in a form of a credit shell). Pls take note that the travelonline commision/profit part of the package sale given by the airline/hotel is non refundable. (6)TravelOnline Credit Shell, should it be available and applicable to you, is valid for 90 days from the date of issue, and if the balance or full amount is not utilised within the 90 days, the amount is forfeited. Please note that credit shells can not be transferred to a third party and can only be utilized towards the corresponding entity that issued the amount in question (e.g. hotel credit can only be used towards the hotel). (7)If the ENTITIES(airlines/hotel/transfers etc) approves 100% refund, TravelOnline reserves the right to deduct thirty percent service fees/cancellation fees from the total paid amount. This is to cover TravelOnline incurred expenses in the provided services and marketing expenses culminating to your booking. Please take note if you are allowed by ENTITIES(airlines/hotel/transfers etc) a FULL refund that is mainly because their service remain unused. On the other hand, TravelOnline has fulfilled all required service culminating to your booking and will continue to provide man-power and assistance in your post-booking requests or cancellation. (8)Please email your reservation officer the appropriate E-FORM to start the process. All requests must be submitted formally for documentation, and made direct to us or through the Reservation Officer from whom the travel arrangements were purchased. At all cases, 100% refund is NOT possible due to fees, processing, penalties, etc. Your reservation officer will give you all possible options and details as relayed to us by ENTITIES(airlines/hotel/transfers etc). For business discretion, privacy and competition reasons, Travelonline does not disclose Travelonline's actual packages breakdown. Your reservation officer will email you instead actual amounts after penalties and charges as relayed to us by ENTITIES (airlines/hotel/transfers etc). (9) Note: Any Cancellation due to force majeure, act of nature, emergency or government mandated closure is subject to Travel Agent booking & cancellation processing / service fee of 30%. Computation will be base on total approve refund (by airline, hotel , transfer etch) less 30%. Rebooking or rerouting is subject to price difference plus Service fee of Php 500 per pax. (1) No-Show Policy: This applies to any or all guests who have a reservation with ENTITIES (airlines/hotel/transfers etc) who do not appear on the reservation date of arrival/departure. No-Show is considered forfeited/cancelled BOOKING. It is not Travelonline's liability if client is late or did not show and is NOT liable for any refunds. Please be responsible in your connecting flight or travel going to your purchased package. * TravelOnline Philippines Travel Agency package prices are advertised at a "Cash Discount" price. Any transactions made by credit card will be slightly adjusted to the original selling price (which is not advertised) without the cash discount. TravelOnline provides and advertises the most affordable option in purchasing a TravelOnline Package. Our main goal is to always provide the special savings and cheapest package possible for our clients package selections. * TravelOnline is not liable for any change in prices or variation of services as shown, and all services and prices are subject to change without notice. * It is required that you call and check with us, or your Reservation Officer, for any alterations/changes or variations to the information shown on our websites. This will give us the opportunity to inform you, or your reservation officer, of any such variations/changes that we are aware of either before you proceed in booking your holiday, or prior to your departure. * Card Fees: Please note that a card fee will be applied automatically to credit card payment amounts: 5% Mastercard/Visa - straight charge. Price may change without prior notice. (1) TravelOnline Philippines Travel Agency has diligently verified and checked all information on our websites at the time of compilation, however, as this information is provided by the chosen hotel & tour/cruise/airline operators, Travelonline is not liable for any inaccuracy or errors contained in the details. (2) FREEBIES details and/or vouchers specify details for amounts for further fees or upgrades to be paid upon arrival. FREEBIES are provided by a third party company for which details may change without prior notice. Upgrade or fees to be paid upon arrival, may change without prior notice. Please call us one day before departure so your travel agent can double check the details for you. * Web Check-in: Once vouchers and eTickets are issued to you, protecting the booking code and booking details becomes your responsibility. Please keep all your travel documents private. The details on your ticket can be used to ammend your travel and for web check-in. You are responsible for protecting and processing your web check-in details. Airlines require that only the passenger must process the web-check-in. In unavoidable cases that you need your reservation officer to process it for you, a travel agency processing fee of Php500 pesos will be required for this delicate process. * Post-booking Add-ons [e.g. baggage/seat allocation/meals]: Once vouchers and eTickets are issued to you, protecting the booking code and booking details becomes your responsibility. Please keep all your travel documents private. The details on your ticket can be used to ammend your travel and add miscellanous services [e.g. baggage/seat allocation/meals]. You are responsible for protecting and processing miscellanous add-on details. A travel agency processing fee of Php250 pesos will be required should you need your reservation officer to process your miscellanous add-on details. * Post-booking Upgrades/Ammendments: Once vouchers and eTickets are issued to you, it is considered paid and final. For upgrades/ammendments processing, a service fee of Php500 will be required. This can be paid via available payment options or to be added to the ammendment bill total. * TravelOnline does not accredit or affiliate with third party travel agencies to avoid miscommunications, commitments or false promises that are inconsistent with our inclusions, terms and conditions. * TravelOnline does not give commision to 3rd party travel agencies SINCE TRAVELONLINE ALREADY HAS THE LOWEST PRICE. There are hundreds of local and International travel agencies who purchase our tour packages and resell it higher to their customers. We are not liable for actions of unaccredited resellers. * TravelOnline is not liable for assurances or guarantees by any person not directly employed by TravelOnline. * Consequently, for clients who find themselves booking Travelonline packages through another travel agency, please take note that Travelonline shall not be held liable for any promises made by a 3rd party travel agency. Travelonline will only honor what is written on our accredited travel agent's (__@travelonline.ph emails) final booking summary, legit travelonline vouchers and our terms and conditions. * For post-booking requests, TravelOnline will only honor requests from the payer of the package (The 3rd party travel Agency), if you Purchase from a third party please coordinate your request to them and they will coordinate your request to us. * If you are a license travel agency and wish to resell our packages please take note that we do not give commissions (however our prices are negotiable depending on the number of pax even for direct clients) because our prices are already the lowest in the industry. Rest assured, adding your mark-up on top of our rates will still be lower and very competitive. * We will only deal to the first person payer/entity (the travel agency) and not directly with the client. The 3rd party Travel Agency must be the one to talk to the clients directly as a middle man. * Vouchers are finalized and labelled as instructed by the first person payer. We will only honor the first person payer for any requests, changes or complaints. Please be guided accordingly. * Keep in mind that altering our vouchers is strictly prohibited and will not be honored by our partners, airlines and hotel. * Pls Do not use our company name on transacting business, ads etc. Alteration of our voucher nullifies any of our obligation with you. We will only honor the final issued voucher as it appears on the final email/attachment of your accredited travel agent. Please be guided accordingly. * For the needs and concerns related to your travel, TravelOnline Philippines reserves the right to disseminate your contact information to your purchased ENTITIES(airlines/hotel/transfers etc). TravelOnline will not be liable for how these entities will further use your data as it is outside our control. Rest assured, we will only disseminate information where information is needed for your booked package. * TravelOnline Freebies are straightforward FREE of charge. Freebies can change or be cancelled without prior notice. Unused or cancelled Freebies are not convertible to cash or replacement. * Pls take note that TravelOnline reserves the right to charge processing fee for the services provided such as Travel Agency assistance on choosing a package, quotations , booking and paying for hotel, airfare, transfer, tours , insurance etc plus the additional services required to process cancellation and refund for each entity . * TravelOnline is a third party service provider offering "middleman" service to BOOK hotels/transfers/airline/tours/meals/etc on behalf of the client. TravelOnline is NOT LIABLE from any problems/expenses/damages caused directly by booked entities: Thus, any complaints, lawsuit, special requests must be directed to the booked entities and shall exclude TravelOnline from all liabilities. Should you avail any of our services, you confirm to be bound by our terms and conditions knowingly or unknowingly. You fully acknowledge that you are voluntarily applying for this trip with the knowledge that travel, whether by Air, Land, Sea, or on foot or other means, contains some inherent risks. TravelOnline (together with our officers, directors, employees, representatives) will not be responsible or liable for (a) any injury, death, loss, claim, act of God, accident, delay, or any direct, special, exemplary, punitive, indirect, incidental or consequential damages of any kind. You hereby fully assume all risk and hereby releases and discharges forever TravelOnline from and against any and all actions, claims or demands for damages resulting from your participation in the trip. You agree that this release shall be legally binding and all passengers booked on this trip and it being your intention fully to assume all the risks associated with this trip and to release TravelOnline from any and all liabilities to the fullest extent permitted by law. TravelOnline reserves the right to charge the client any damages cause to TravelOnline name and reputation. IMPORTANT PERSONAL NOTE: Before making the payment please make sure that you are 100% happy with the Airline, Hotel and tour that you are going to book. If you want another Hotel or Another Airline Carrier please let your TravelOnline Reservation Officer know before payment so your TravelOnline reservation officer can send you another quotation. Once you pay your package, it is considered SOLD and any changes after booking is not allowed and subject to penalties. Every costumer has a different standard that's why Travelonline wants to give you the chance to request an alternative quote based on your preference. It is outside of TravelOnline's control and liability if the client is not happy with the hotel, airline, transfers or tour that they have to book. WEBSITE NOTE: For all text/details included in the page, we give all credit to whom credit is due. TravelOnline Philippines reserves the right to be informed of duplications or comparisons from other websites. Give us the one time courtesy notification and we will update/alter the statement or detail in question. All request must be made in writing and acknowledged by TravelOnline website administrator to be valid. Give us 3-5 business days to make the requested and necessary ammendments.